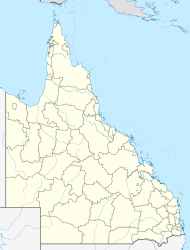 Kalinga is a suburb of Brisbane in the City of Brisbane, Queensland, Australia. Kalinga is predominantly flat, with a mix of small apartment blocks and houses, with some older style Queenslanders still extant. The area borders with Kalinga Park. This area is notable for the original residence of Alfred Lutwyche, known as Kedron Lodge. The name Kalinga derives from Aboriginal word Ngalinnga ("ngalin-nga"), probably from the Yuggera language, Turrbal dialect, meaning belonging to us. Between 1927 and 1962 an electric tram service operated by the Brisbane City Council served the suburb, branching off the Chermside line at Kedron Park Road. The name Kalinga had been in use for the area for many years as a neighbourhood within the suburb of Wooloowin, but it was not until 16 October 2015 that Kalinga was officially gazetted as a suburb, having been excised from Wooloowin following requests from local residents. ^ a b "Kalinga - suburb in City of Brisbane (entry 49667)". Queensland Place Names. Queensland Government. Retrieved 10 October 2017. ^ "Minutes of the meeting of the Kalinga Wooloowin Residents' Association held on Thursday, 29 August at the Kalinga Bowls Club" (PDF). Kalinga Wooloowin Residents' Association. Retrieved 15 March 2014. ^ "Proposal: Discontinue the unbounded locality of Kalinga and to alter the boundaries of the suburbs of Wooloowin and Clayfield to create the new suburb of Kalinga". Queensland Government. Retrieved 27 May 2015. ^ "Kalinga Park (entry 602584)". Queensland Heritage Register. Queensland Heritage Council. Retrieved 19 June 2013. ^ "Kedron Lodge (entry 600238)". Queensland Heritage Register. Queensland Heritage Council. Retrieved 19 June 2013. "Kalinga". Queensland Places. Centre for the Government of Queensland, University of Queensland. This Queensland location article is a stub. You can help Wikipedia by expanding it. This page was last edited on 20 January 2019, at 01:52 (UTC).